I had such fun playing with all of the lovely beads and findings that my wonderful partner, Dolores Raml sent. Be sure to visit her blog, CraftyD's Creations after you finish reading here. She made the most amazing pieces with the ingredients I sent. Totally different than what I had in mind when I was picking out special things for her. 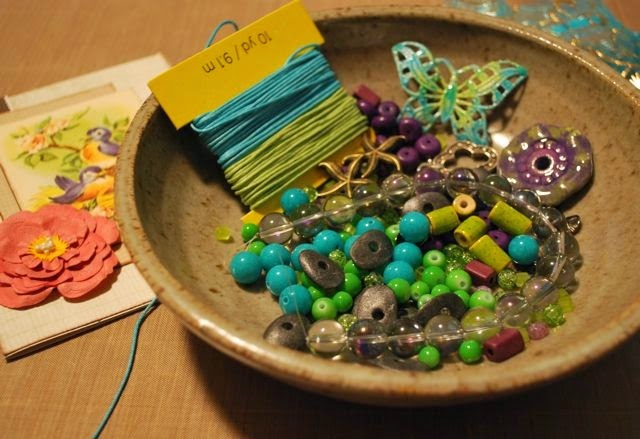 That's what makes Lori Anderson's Bead Soup Blog Hop so fun. She mixes us all up and somehow pairs us with great people who approach this jewelry making adventure with new eyes and challenges us to do the same. Can't thank Lori enough for all the hard work and dedication to this project. Be sure to visit her at Pretty Things Blog as well to see her lovely soup too. Isn't you mouth watering just looking at those yummy goodies? My first challenge was that gorgeous enameled butterfly. 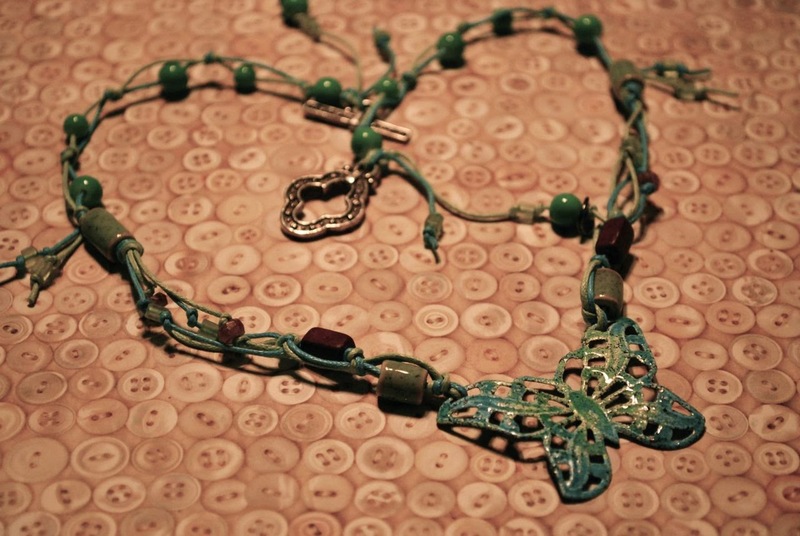 I wanted to use the cording for a necklace with the butterfly as the focal piece. And a challenge it was! I've never used cording before in jewelry so it was a bit tricky for me. How do you get the cord through the tiny holes in the beads??? That limited me to which beads I could use! But of course, Dolores sent lots of variety to play with so it wasn't a problem. And...... Drum roll ...... Here's what I came up with! What do you think? I'm pretty pleased with my first attempt at using cording and I know I will be playing with it again soon. Thanks again Lori and Dolores for gently pushing me out of my comfort zone to try something new! And then there was the cool polyclay stone looking bead Dolores made. 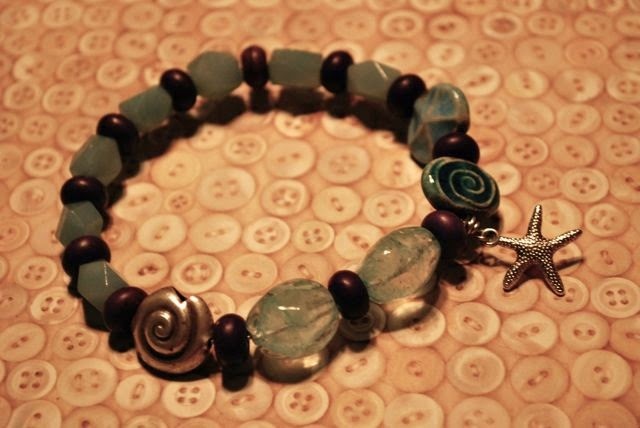 Perfect for the focal piece of a bracelet! (Funny--when you visit Dolores' soup, you'll see she made a bracelet very similar! Great minds thinking alike--even when not thinking in their usual way!) I like big bracelets and many times will make them with a few strands together but this time I wanted to try it in a different way (the whole idea behind Bead Soup!) so I used the large polyclay bead as my base. Think I will really like wearing it. Love the purple and green color combination. I had quite a few of the purple round, flat-ish beads left so I knew another bracelet was in order...but what to use them with? I've had these large clear-ish stone beads for the longest time and haven't ever really known what I wanted to do with them. 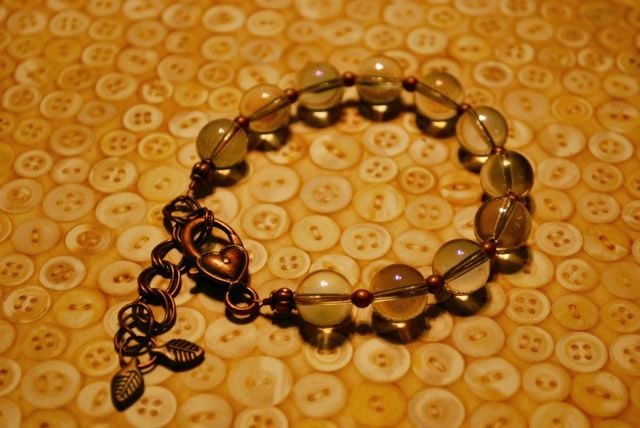 I think the smooth round, wooden beads are great between the shiny quartz stones. It looked a little plain so I added the silver and ceramic accents to jazz it up. 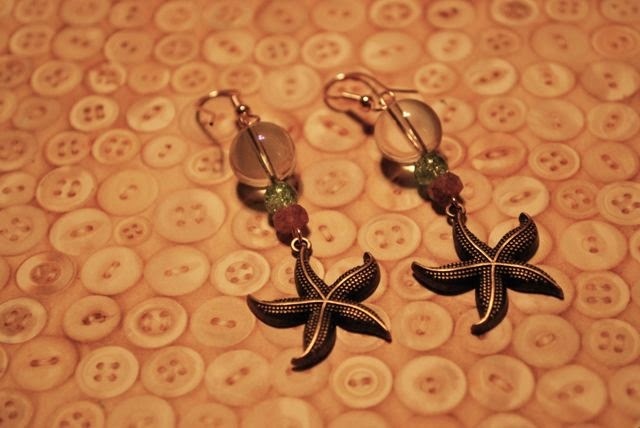 I know, they are 'sea themed'.... can't do everything totally different! This bracelet is a bangle; made on a simi-stiff joined wire so there is no clasp. 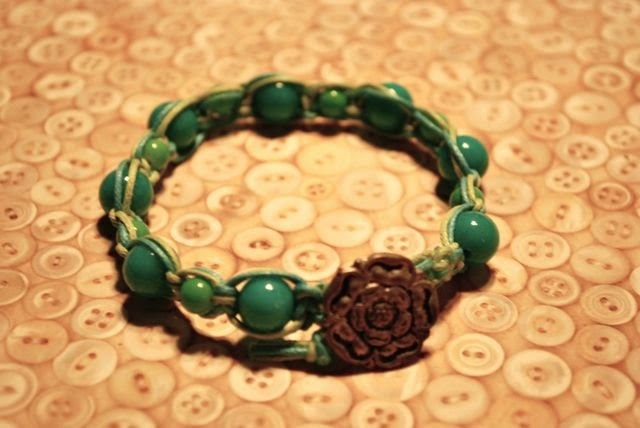 Hmm....more beads + more pretty green and turquoise string = bracelet! Remember I said I had trouble figuring out how to use the beads with those tiny holes with the cording? I knew those turquoise and green beads belonged with that green and turquoise string..... I took a piece of flex beading wire and attached it to a shank button, strung the beads on the wire and knotted the string to the shank also, then macraméd around the beads. All that macrame from the 70s came back to me (well sort of! I didn't get very fancy). Fun! Think I'll be trying some more of that too :) (BTW - I added a lot of clear glue to the end knots thinking the flex wire will probably want to work it's way out of the cording when it worn even though I did put crimp beads on the ends) The ends of the string were just knotted, leaving a loop to slip over the button for the clasp. Well, that's pretty much my soup. Hope you found it tasty! I do have some beads left and will be making earrings with them but since earrings are what I do most of the time I didn't want to make them part of my soup. I'll share those later. 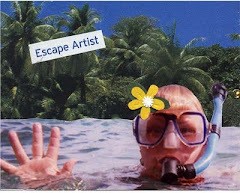 Be sure to visit my partner Dolores and you should visit her Etsy Shop too for her fun goodies. Listed below are the rest of the party people--visit them too! Lots of yummy soup to be sampled! Enjoy! And Thanks for stopping by! Reveal day is May 3rd. 500 fabulous Jewelry Artists will be posting their Soups on their blogs that day. Be sure to come back for links to the treasures! 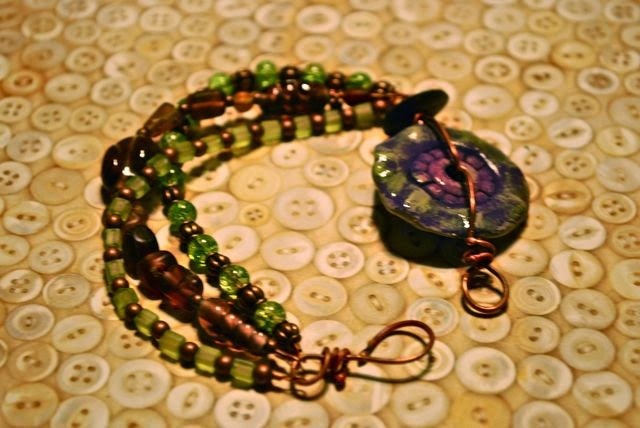 For more Bead Soup Blog Hop info, you can check out our fearless leader, Lori Anderson's, website HERE! Have fun hopping. Aloha! 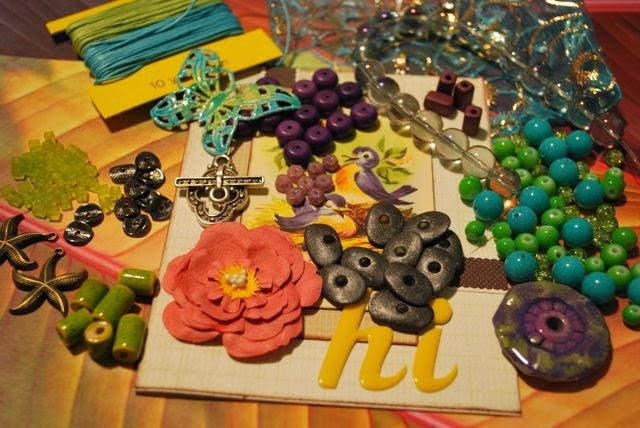 Lori Anderson is hosting her fabulous Bead Soup Blog Hop again - Woohoo! Always such fun. There are something like 500 people in this Hop....WOW :) That's A LOT of coordinating. We can't thank you enough for the time and effort that goes into this Lori!